It was another successful run for our BC Bowlers at 2016 Canadian Indoor Singles Championships. Both Pricilla Westlake (TLBC) and Hirendra Bhartu (NLBC) won Gold Medals and earned the right to represent Canada at the 2017 World Cup held in Warilla, Australia, March 14th to 21, 2017. Priscilla Westlake wins back to back titles defeating Elizabeth Mcormack – ON in a tie-break. It wasn’t an easy game thats for sure as Pricilla had to user her determination to battle back as she lost the first set 5-7. Stay patient she started to find her form winning the second set 10-5 and eventually winning the tie-break 5-0 to take home Gold Medal for the second time in as many years. When contacted about the Gold Medal match Westlake described the game. “I played the best I could this week and I feel I really brought my game when I needed it most to force a tie break against Elizabeth Cormack in the gold medal match”. When asking Westlake about her return to Warrilla, “I’m definitely looking forward to going back to Warilla”. “With the experience from my first trip to the World Cup earlier this March 2016, I look forward to being apart of the camaraderie shared among athletes representing all the different nations, as well as competing against, gaining experience, and learning from some of the best bowlers the world stage has to offer”. “I am grateful to have earned my way to the 2017 World Cup at Warilla next March and I am thrilled to be representing Canada once again at this event. It is always an honour and a privilege to wear the maple leaf at international competitions like this one”. 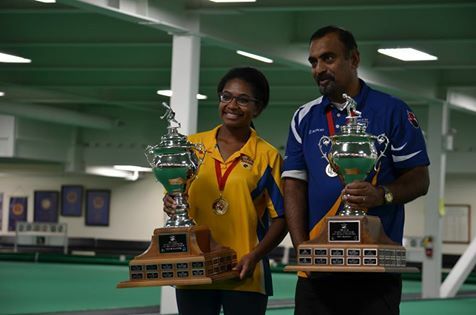 This adds another trip for her as she will also be heading to New Zealand in a few weeks as part of the Canadian World Bowls Team with fellow Bowls BC member Steven Santana. Hirendra was in fine form all week as he was head and shoulders above the field this week. Throughout the week it was a common theme to see a “W” in the Win column for Bhartu as he went 11-0 in the Round Robin with a combined +146. It was an almost near perfect tournament with 23 of 24 set wins. Defending champion Vince Mai took home the only set with a 7-6 score in their round robin game. In the Final game he would defeat John Bjornson from Manitoba 9-6 , 7-6 to win Gold Medal and earn his ticket to Warilla once again. The is the 4th time that Hiren will be heading over to represent Canada at the World Cup as he added another Championship to his already long resume of Bowls accomplishments. In a conversation with Hiren, I asked if he was happy with his play throughout the week: “I played great. I felt very comfortable and consistent. Statistically about 65%”. Knowing Hiren is no stranger to the he was quick to respond when asked if he was looking forward to going back to Warilla? Yes very much so. My last trip was 2008 and I have gained more experience since then. I look forward to the competition which I know will be of a very high level and perform to a level that I know that I can. I know I am a much better in terms of consistency and experience since the last trip. Like everyone else playing my goal will be to get into the play-offs first and then go for the ultimate prize. When asked if there would be another one of his Famous Curries in Australia, he laughed and said, I am looking forward to connecting with old friends and yes making and sharing some prawn curry from the Shell Harbour seafood market. In the Bronze Medal matches it was two BC Bowlers – Linda Ing and Josephine Lee that battled it out, as Josephine ended up winning the game 7-8,13-3 and 3-1. On the Men’s side it was Greg Wilson (AB) who got the edge on Vince Mai (BC) winning the game 10-0, 8-4. The Indoor Bronze added to Wilson’s Silver Medal earlier this year at the Canadian Championships where he skipped the Fours. Congratulations to all the Participants at this years event. A special thank you to the Pacific Indoor Bowls Club, Jim Buttar who worked tireless all week with doing the scoring, Head Umpire David Ashcroft and to all the Volunteers who helped make this Championship a successful one.